At first thought to be an April Fool’s joke, the news that Ashton Kutcher will play the late Steve Jobs in an indie film chronicling the life Apple co-founder has some clapping their hands and others shaking their heads. Matt Whiteley will write the script, and Joshua Michael Stern of Swing Vote fame will direct the movie. The production is slated to start in May, when Ashton Kutcher is on hiatus from his main project, hit TV series Two and a Half Men, Variety claims. The movie should not be confused with another Steve Jobs biopic, based on Walter Isaacson’s biographical book and currently under development by Sony Pictures. Apple co-founder, Steve Wozniak, approves of the casting, having told TMZ, “The fear that many might have is that Ashton was selected because he’s ‘hot’ right now. But I feel that his selection was done in the most professional manner. And I’m glad that he’s onboard. I think he’ll put a lot into it and that he cares about this particular subject.” It’s no secret that Kutcher is an investor in quite a few technology companies and as such it’s quite believable that this is a subject near and dear to him. “It’s almost too bad that Steve Jobs is gone. His opinions and guidance, as to the story and film crew and cast would have been invaluable.” Wozniak added. Looking at pictures of young Steve Jobs and Ashton Kutcher, we can definitely see a resemblance. Looking the part and acting it are two different things, though. What do you think? 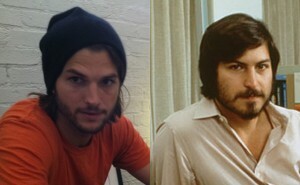 Does Ashton Kutcher have it in him portray one of the most charismatic and celebrated businessmen of all time? Share your opinions in the comments. Who else would you like to see play Steve Jobs?